In January this year, I accompanied Global One on a delegation to Pakistan to see the work being done to eradicate polio and assess how Pakistani diaspora in the UK like myself could engage with efforts there. Despite the fact millions of British babies receive polio vaccinations every year at birth, Pakistan, along with Afghanistan and Nigeria, is one of three countries in the world where it is still an epidemic. Overshadowed by the ghost of Osama Bin Laden, there is a sense of distrust towards both western NGOs and government workers delivering vaccination programmes in Pakistani communities, after a false immunisation campaign led by a Pakistani doctor was used by the CIA in 2011 to track him down. Beyond the headlines about polio eradication in Pakistan, I knew very little about it. It’s a common tale of woe – when the diaspora are amputated from the goings on of the motherland. The opportunity to go on this delegation was as good an opportunity as any to learn something about the country that was home to my grandparents. Our first stop was a primary school for young Afghan refugee girls in Nowshera, the northern province of Khyber Pukhtunkhwa (KPK). I was immediately struck by the rubble surrounding the white painted walls of the school, remnants of houses which belonged to Afghan refugee families. 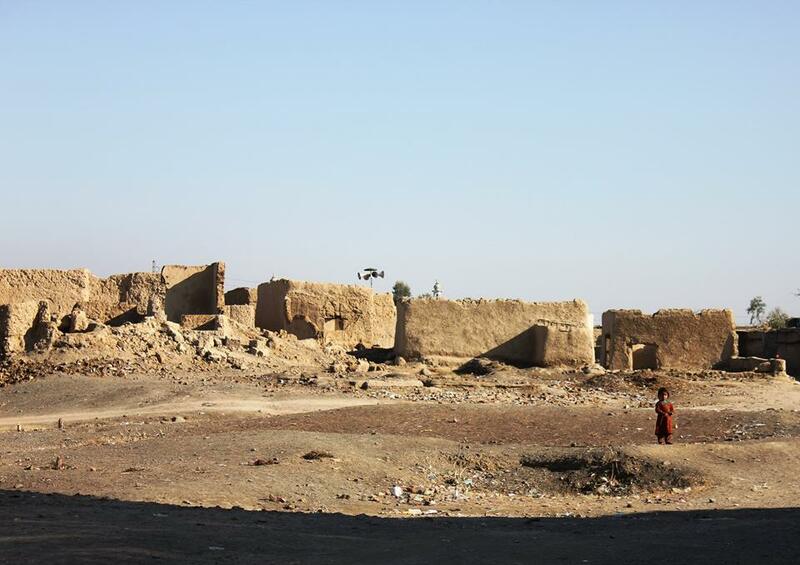 The wood which used to form the roofs of these homes had been taken by Afghan families repatriated back to Afghanistan by the Pakistani government. With no other form of transportation, the wood was used as their only form of shelter from the sun, as they lumbered the heavy load from one country to the other. At first glance, the rubble looked entirely abandoned. But every time I turned to look away, children with blonde-flecked hair, sun-burned skin and wide eyes scuttled out of the sand like mice. The sight of these children appearing and disappearing like ghosts was eerily reflective of the problems with the porous border between Afghanistan and Pakistan. With no official line demarcated, there is no knowing who is crossing. This fluid movement of people has been one of the many uphill struggles to eradicate polio. At the gates to the school, a group of young school girls with white hijabs wrapped around their small faces, smiled at me in welcome. As they led me in, I was greeted by the sight of over forty women sat on foldable chairs with their backs to me. One of the facilitators at the school informed me that they had been waiting for five hours in the winter sun just to meet with us. Their anticipation of the arrival of strangers from another country was both endearing and overwhelming. Her name was Seema, one of the quietly witty, dedicated lady health workers I met during my trip. Within a few years of her marriage, Seema’s husband died suddenly, leaving her with two young children to fend for. She was later approached by someone in the community to become a health worker, and after completing her training, she’s been working with women in Nowshera ever since. It cannot be understated how instrumental female health-workers are in the eradication of polio. They are the gatekeepers to the homes of women in Pakistan. Like Seema, they are well-known, trusted community members who go into homes administering vaccinations, giving advice on nutrition, sanitation, and family planning. In communities that are destitute and have very little access to medication, nutritional advice might seem like bare necessities. But malnourishment in addition to poor literacy rates is heavily linked with rates of polio. It’s ironic that Seema’s hardship was a blessing for the Afghan refugee women at the school, but her services there are gold-dust. I later met with the headmaster of the school for Afghan refugee girls, known by everyone as Ustadh (teacher). He was a tall, gentle and erect figure who migrated from Kabul twenty years ago. Ustadh was a man of many hats: not only was he the headmaster of the school for Afghan refugee girls; he was also a member of the local shura, a council of elders whose word was effectively law in the communities they oversaw. Ustadh spoke about the grim futures of many of the children attending the school. “Beyond these walls, there is nothing for them out there.” On vaccination, he spoke about how it was a point of distrust for many, particularly because some local religious scholars had issued fatwas, legal religious rulings, claiming that it wasn’t permissible for Muslims to vaccinate their children. The shura was a very necessary influence in appealing to religious scholars and members of the wider community and educating them that this was not in fact true, and that to protect children from debilitating viruses such as polio through vaccination was a religious obligation. Speaking to Ustadh, it became clear that the eradication of polio isn’t simply a matter of swooping in and administering drops and injections. It’s also a matter of winning the hearts and minds of people that requires cultural and religious sensitivity, something that men like Ustadh are very acutely aware of. It’s an uphill struggle on many fronts, which requires many different solutions. Our second stop was a health clinic nestled in a slum on close to the coast of Karachi. In Nowshera, the women I met were mostly Pashtun-speaking from Afghanistan, however; here there were women from the Sindh region, from northern Pakistan and Afghanistan, who had their own distinctive dress, language and culture. The notorious Karachi heat, even at that time of year when it was considered to be cool, was beating down hard, a far cry from the cool northern breeze of Nowshera. Apart from a few shopkeepers and some children walking barefoot, there didn’t appear to be many people out on streets lined with colourful plastic bags tossed to the side onto mounds of rubbish, burning under the sun. The health clinic, however, was a buzzing hive of activity. Mothers streamed into the clinic, their young babies clutched tight in their arms. 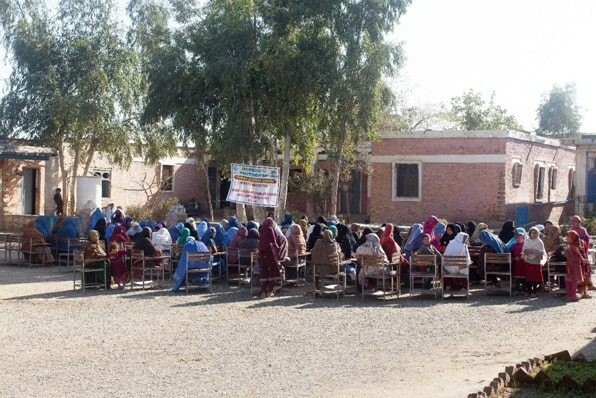 As with Nowshera and any other region in Pakistan, it was the female health workers manning the helms. I watched as they spoke soothingly with mothers who would then hesitantly hand over their children, knowing what was to come as the health worker reached into the cooling box beside her, administering the polio drops followed by not one, not two, but three injections which disappeared into the soft pink flesh of babies, a piercing cry bellowing out from their small mouths. In a few seconds, it was over. It was as quick as that. Then the next mother would come in. Saffiyah, only a few months old at the time when I met her. Before she went into the clinic, her face was jubilant as her mother proudly held onto her, playing with the beaded necklace she made herself around her daughter’s neck. After receiving her injections, Saffiyah’s eyes welled with tears, smudging the kohl in her eyes. It was the small price she had to pay for a life free of disease. At the Karachi clinic, health workers didn’t just administer polio vaccinations, but other vaccinations such as tetanus and TB. This was part of a growing call to push through not just polio vaccination, but routine immunisation for other diseases as well. As much as eradicating polio is a priority, it is just the tip of the iceberg. Polio is a gateway disease to many others. If routine immunisation is pushed through, it will offer a long term solution which could see education and sanitation efforts implemented as well, as well as a polio-free Pakistan. Along with a few other women, Maanvi (pictured below) was one of the community health workers who oversaw post-natal and anti-natal care in the area.